Choosing clothing colors that go well together is an art and a science. They even have University Degrees in Color Theory. We’re going to try to make it easy for you to know which colors look good together and also look best on you. We’ve learned color theory in Color Coordination, and we know how to match patterns from Coordination so we’re now ready to put it all to practical use. First, a little color science won’t hurt! Color is a visual effect resulting from the eye’s ability to distinguish the different wavelengths or frequencies of light. The apparent color of an object depends on the wavelength of the light that it reflects. Our goal when we put the various elements of our clothes together is to produce harmony. Harmony is something that is pleasing to the eye. It engages the viewer and it creates an inner sense of order, a balance in the visual experience. At one extreme is a visual experience that is so bland that the viewer is not engaged. The human brain will reject under-stimulating information, such as a monochromatic ensemble with all the same texture. At the other extreme is a visual experience that is so overdone, so chaotic that the viewer can’t stand to look at it. The human brain rejects what it cannot organize, or understand, like four conflicting patterns and colors in an ensemble. Movie costumers often have characters they want to depict as weird wearing two incompatible patterns. In summary, extreme unity leads to under-stimulation, while extreme complexity leads to over-stimulation. Harmony is a dynamic equilibrium. 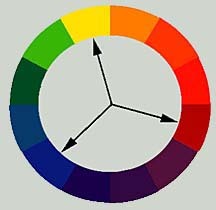 All color theory is based on this wheel. There are three primary colors: red, yellow and blue. These are the only colors that can’t be made by adding any other colors together. You can’t add two other colors to make red. But, you can combine two or more of the primary colors to make all the other colors. 3. Intensity – the degree of purity or strength of a color (hue) or how bright or muted the colors are. Core Color is the dominant color in a color scheme. It’s the color of the principal item in your ensemble like your suit or a sweater. Accent colors are the second and sometimes third colors used in a color scheme. The accent colors may be complementary, triad, analogous or neutral. These are called pure colors because mixing them with each other and/or with white or black can make all other co colors. The second (or secondary) triad colors in the color wheel are orange, green and purple. Made by mixing two primary colors together. Mixing red and yellow make orange, yellow and blue make green, and combining red and blue produce purple. Are those directly opposite one other in the color wheel. When placed next to each other, complementary colors intensify each other and make the colors seem brighter. Green and red are opposites and that’s why hunter green pants look great with a burgundy sweater. Blue is opposite of orange so gold, rust, and brown complement shades of blue. Also known as adjacent colors, harmonious colors, and related colors. Colors, which lie next to each other on the color wheel (contiguous colors). They harmonize since they each contain some of the same color. An example would be blue pants, a blue-green shirt and a purple sweater. Families of analogous colors include warm colors (red, orange, yellow) and cool colors (green, blue, violet). Designers often build color schemes around two or three related colors. Select two warm colors with one cool or two cool with one warm to create dynamic harmony. Examples: navy suit, light blue shirt and red tie, or a yellow shirt, rust jacket and blue jeans. Neutral: shades of white, black, gray or tan. Neutrals work well with all colors or may be worn together. Khaki pants, white shirt and a gray sweater worn together create an ensemble made up of all neutral colors. Together, all neutrals may not be a dynamic look, but it is sophisticated. Black, White, Gray, Tan, and Brown are not separate colors on the color wheel, but are made up of different percentages of red, yellow and blue. To make neutral colors mix either all three primary colors, or mix a primary and secondary color (secondary colors are made from mixing two primaries). How to make a brown? Mix a color with its complementary color. Add orange to blue, purple to yellow, or green to red. Each of these combinations makes a different brown. How to make a grey? Mix some orange (or yellow and red) with a blue then add some white. You can also mix blue with an earth color, such as raw umber or burnt sienna. Caveat: You must pay attention to tone (adding gray), tint (adding white) and shade (adding black) of a hue (pure color). Green and red are complementary colors, but if you match pure green and red you’ll look very Christmassy! Which is fine for Christmas! But burgundy and hunter green are quite stunning together. You can also opt out of mixing and matching color and go Monochromatic. All one color, but different shades, tones or tints. All blue attire could consist of a Navy suit, light blue shirt, dark blue tie, blue pocket square, etc. Add some contrast to this combination by using texture and pattern. Some of your clothing items should be smooth; others rough in texture. Some items could be patterned; others solid. These are Colors that traditionally go well together, but remember this is only a guide. Compliment, don’t match, your shirt and/or tie with your pocket square. If you do have a yen to match go for the shirt, never the tie. For a very conservative look try plain white, even if it is a little stuffy. There was a brief period such as the early 1940’s when men did match tie and pocket square, but thank goodness we’ve moved on. There is some school that believes that the tie or jacket and pocket square should contrast in fabric. If you’re wearing a silk tie opt for a linen square, or a tweed jacket is best worn with a heavier more casual square of wool or cashmere. White linen would appear too formal. This theory has some merit, but silk still looks great with any fabric. *Tip for matching trousers to sportcoats: The bone buttons of a sport jacket have a range of colors. You can choose trousers that match any of the colors of the buttons and they will go perfectly. Caution: You must pay attention to tone (adding gray), tint (adding white) and shade (adding black) of a hue (pure color). Green and red are complementary colors, but if you match pure green and red you’ll look very holiday like, which is fine for December. But burgundy and hunter green are quite stunning together. Seasonal Colors: Some colors are more appropriate at certain times of year than others. Like the pastels of yellow, are usually associated with summer, while autumn colors are rust, brown, green, and burgundy. Wearing rust in the summer, or light yellow in the fall looks out of place. Think Contrast: Try one light element with two dark, or one dark with two lights, such as a charcoal suit, white shirt and red tie, or tan suit with yellow shirt and green tie. Or khaki pants and a dark blue shirt. Color Value: Dark colors recede thus making you look thinner, and light colors project, which tends to bulk you up. Dark colors are more formal than light colors. Monochromatic: all one color, but different shades, tones or tints. All blue attire could consist of a navy suit, light blue shirt, dark blue tie, blue pocket square, etc. Add some contrast to this combination by using texture and pattern. Some of your clothing items should be smooth; others rough in texture. Some items could be patterned; others solid. Neutral: We talked about neutral colors, but you can dress in shades of white, black, gray or beige. Khaki pants, a white shirt, and a gray dress shirt are all neutrals. It may not be a dynamic look, but it is sophisticated. Color Value: Dark colors recede thus making you look thinner, and light colors project, which tends to bulk you up. Dark colors are more formal than light. Here’s a simplified way of determining colors. Remember, however, there are certain colors that are acceptable for business and many that are not. An ideal ensemble for a job interview would be a navy suit, white shirt and a burgundy necktie. If you, from the information below looks great in fuchsia, please don’t wear a fuchsia suit! Think contrast. Try one light element with two dark, or one dark with two lights, such as a charcoal suit, white shirt and red tie, or tan suit with yellow shirt and green tie. Or Khaki pants and a dark blue shirt. Your skin tone is the most important factor in determining the colors that look best on you. With the help of the list below, decide which season most accurately describes you complexion. Once you know your season, you will have a personalized guideline of colors and shades that work best for you! “Winter” is a cool tone. People with winter complexions have blue or pink/rosy undertones.Skin can be pale white, yellowish-olive, or dark. Those with the Winter color profile have a lot of depth to their coloring and a lot of contrast between their hair color, eye color and skin tone.Winter people have brown hair, with deeply colored eyes. Many Asians and African Americans fall into this category.People with white-blond hair may also be winters Winters should wear colors that are sharp, stark and clear. They look best in intense, rich colors, like white, black, navy blue, red, and hot pink.For lighter colors, wear bright white or icy pastels, such as cool blues, pinks and yellows. Winters should avoid dressing in earth tones and subdued colors like pastels, and beige, orange and gold. “Summer” is also a cool tone and like wintercomplexions, have blue or pink undertones.Skin is pale and pink.Summers have a low level of contrast between their hair, eye color and skin tone.Summers often have blonds or brown hair with pale eyes.If you’re a trying to discriminate between winter and summer, winters are usually have brown hair and summers are mostly natural blonds. Summers should choose soft neutrals and pastels, as well as muted colors with cool undertones. Powder blue, dusty pink, mauve, rose-brown, lavender, plum, and pale yellow are all good color choices. Summers should avoid intense, vivid hues because they will look harsh. Nor should Summers wear earth tones, black or orange. Autumn is a warm tone and people with this complexion have golden undertones in their skin, like a pale peach, golden beige or golden brown.Many have brown or red hair, and golden brownHowever, golden blond and black hair coloring can also fall into this range.Autumns have a lot of depth to their coloring and skin tone. Rich golden, spicy, and earthy colors will accent their complexion. Autumns should selectboth muted and rich warm colors that are seen in autumn leaves and spice colors, such as camel, beige, olive, orange, gold, warm grays, and dark brown. Autumns should avoid clear, bright colors and black and white, which will make them look tired and faded. They should also avoid pastels and blue tones, which look cold against Autumns complexion and give a pale appearance. Spring is also a warm tone. Spring complexions have golden undertones and are usually creamy white or peach.Springs have extremely light, ivory skin color.People of this coloring are usually natural golden blonds, auburn, or have strawberry blond red hair.Springs also have very clear, light blue and green colored eyes. Freckles and rosy cheeks are also characteristics of this group.If you can’t decide weather a client is an autumn or a spring, remember springs tend to have pale eyes while autumns have dark eyes. Springs can wear very pale, soft colors, such as peach, camel, golden yellow, golden brown, and aqua. They will also look good in ivory, bright greens, true reds, clear blues and coral. Springs should avoid black and white, which are too contrasting. They should also stay away from dark, dull colors. This is the stuff artists, master gardeners, and interior decorators study, but now you can use this knowledge to paint a picture with your clothes!